John Constable is one of the most talented English landscape artists, who incomparably conveyed the beauty of English landscapes, fresh air and the unlimited energy of nature. Constable did not paint his paintings according to academic rules, he tried to create a landscape as close to reality as possible. 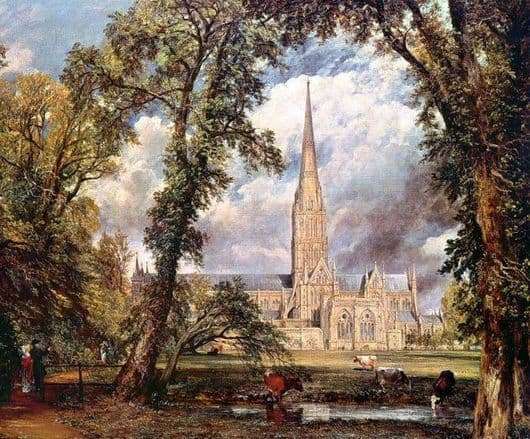 The specific writing style of the English artist can be seen in his wonderful painting Salisbury Cathedral, painted in 1825. The innocence of nature, the majesty of the cathedral and the realism of the image, together create a unique landscape. The cathedral itself is depicted in the gap between the trees, the building against the sky even more attracts admiring glances. John Constable in the 20-30 years. XIX often visited Salisbury Cathedral and had long planned to write it, making sketches and selecting the appropriate angle. But once in 1822 he received an order from Bishop Fisher to depict the cathedral on canvas, for which the artist willingly took it. But the task was not easy, as the first bishop was not very satisfied with the picture, the reason was the dark sky over the cathedral, then the Constable wrote a new picture that satisfied the taste of the bishop. There is a rather interesting feature in the picture, two people are depicted in the lower left corner, this is Bishop Fisher and his wife watching the beauty of Salisbury Cathedral. Looking at the picture, the viewer immediately wants to find himself on this English lawn and feel the intoxicating smells and fabulous sounds of nature. Another important line of the picture is the comparison of the creations of nature and the creations of man, the cathedral is compared with the trees, the artist has always believed that the dried old tree is more beautiful than any new structure. Constable always remained an “artistic patriot” because he always portrayed “his old England” in his works.